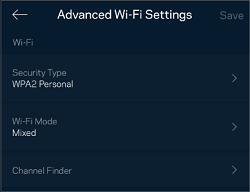 This article provides an overview of the Wi-Fi Settings feature on the Linksys app. NOTE: The settings can be configured by tapping on the Menu icon and selecting Wi-Fi Settings. Wi-Fi Name & Wi-Fi Password Displays your Wi-Fi credentials. Tap the field to make changes. Security Type - Tap to make changes to your security settings. Options are WPA™ / WPA2™ Mixed Personal, WPA2 Personal (default), or None. It is recommended that you stick with the default security type. Wi-Fi Mode - Mixed mode is the only supported option. 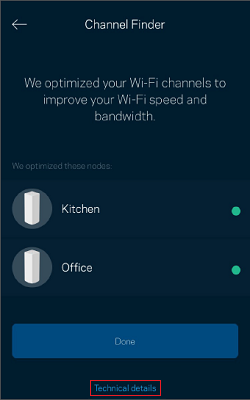 Channel Finder - Velop has simple Auto Fix Wi-Fi button to automatically select the best channel to resolve congestion and interference with other Wi-Fi signals. Wi-Fi signals broadcast on multiple channels. The more nearby Wi-Fi networks using the same channel, the worse the performance will be for each of them. Channel Finder will investigate each node in your Velop system to find the channel with the least amount of traffic. We have to turn OFF Wi-Fi while the Channel Finder is in process. All devices will be disconnected temporarily. If we find better channels, Channel Finder will make the changes for you. If you are already using the best channels, we won’t make any changes. After channel scanning is complete, you can click on Technical details to view the new channels. In the example below, the previous channels are on the left. If any changes are made, they will be displayed on the right side with an arrow. 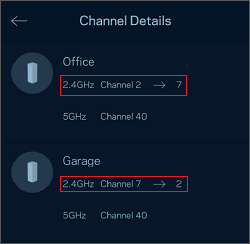 For example, on the Office node, the 2.4 GHz radio went from channel 2 to channel 7 and the 5 GHz radio did not change. It automatically determines which channels to change based on your environment RSSI. 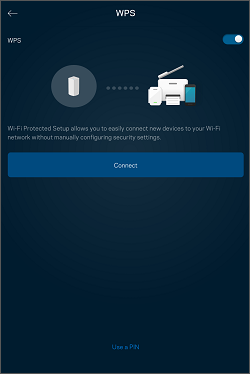 Connect a Device with WPS Tap Connect to add a device using Wi-Fi Protected Setup™ (WPS). 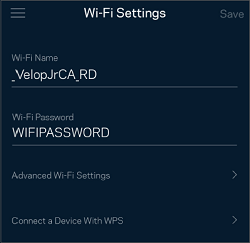 WPS allows you to easily connect new devices to your Wi-Fi without manually configuring security settings. NOTE: Your Wi-Fi device must also support WPS. Toggle the switch to turn OFF / ON the WPS feature. Once you press the Connect bar, you have 2 minutes to push the WPS button. To connect using a PIN or if your device asks for a router WPS PIN, tap Use a PIN. NOTE: WPS is configured via the Linksys app. There is no external button on the node itself.